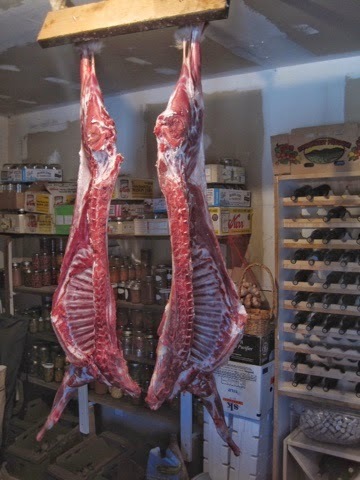 For the New Year in 2014, we slaughtered two goats on the in-laws' homestead in Idaho. We blindfolded them and fed them handfuls of corn and shot them in the back of the skull. When they collapsed, we cut their throats and held them until they stopped moving. It was harrowing, an experience I recommend for any meat-eater. One minute you have trusting, bleating creatures and the next you are upon them, cutting off their breath while they shiver and die. Nothing to glorify there. Just a base act of brutality, death for the sake of life. 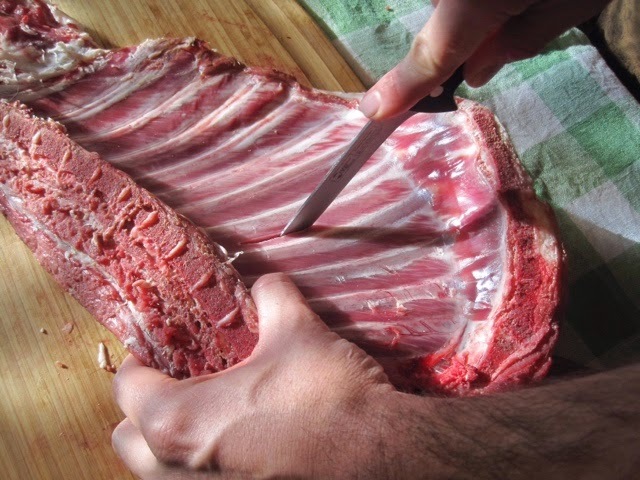 It caused me to lose my appetite and to look askance at the food-scene's beast-eating indulgence, chefs posing with dead pigs, tattoos of butchered yearlings- I'm as guilty of it as the next meat-lover. The whole defiant glorification of dead muscle and guts currently en vogue. I believe in well-raised animal protein as a source of sustenance and embrace the hard fact of killing as a bitter foundation for life. But I don't take it lightly. 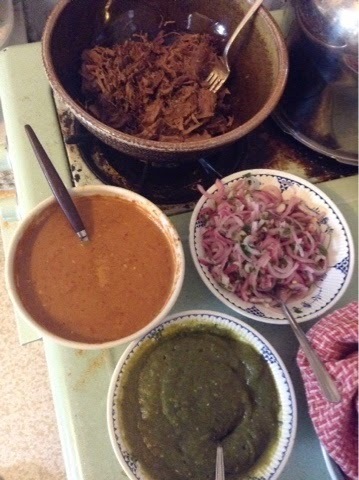 Almost exclusively, I have turned the goat I killed into birria for tacos. Today I steamed the last of it for 3.5 hours in a bottle of astringent peppercorn porter I made in 2013. It's just so easy. After experimenting with marinating in aromatic chile pastes, I decided I prefer simply salting the goat and letting it rest overnight. Then I steam it over a bottle of beer in a Dutch oven at 275 degrees for 3.5-4 hours. Today, for the Preakness Stakes, I made some red onion pickles, a red salsa out of arbol chiles and a green sauce out of jalapeños, roasted poblanos, anaheims and tomatillos. We rolled the rich, dark meat in corn tortillas with the sauces and washed the tacos down with bourbon, rye and cold Modelos. Thanks be to the goat! Let it rain, and go American Pharaoh! Did the goats have names? The pet/livestock boundary is so fuzzy I imagine for micro-herds. 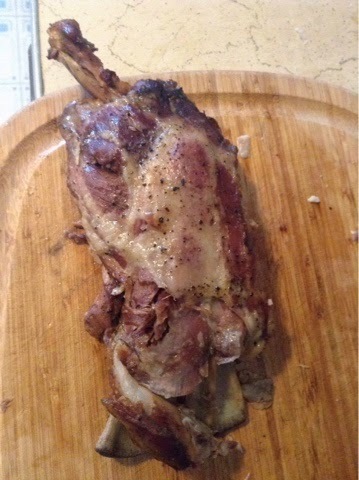 But at least you have killed these goats in a quick humane way and consumed them appreciatively and deliciously. There is a wonderful Japanese anime called Silver Spoon on youtube about a agricultural high school that also treats this subject in a thoughtful and sensitive way. The goats were very well cared-for, but my in-laws did not go as far as naming them. I didn't raise them and still it was very hard for me. I will have to check out Silver Spoon. I'm cheering you on in your quest to pare down your stuff. I've been doing the same in a mild fashion. I find getting rid of things invigorating. When was the last time I wore that pink pearl snap button down? Dump it! I am making progress, sort of. The thriftiness in me makes it hard to get rid of anything but in Berkeley, you can just leave it out on the curb and someone will take it within a day if not within the hour. That pink button down sounds lovely- what will you wear on Day of Pink or even Pink Shirt day. If you have a sewing machine, shirts make great cushion covers. One of the good things about living in a college town, With the exception of the TV that has been sitting on the curb across the street since March, pretty much everything left on the lawn or in the alley gets hoovered up.